What an excellent, thought-provoking review, the first I have read to really try and put the movie in some sort of Hollywood-historical context, despite the fact that it's what, number 7? A pleasure to read, as always. And the third-act collapse -- you nail something that bothers me about so many action movies in general, although superhero movies are particularly susceptible. The fight has to go on and on and on and on and he's dead no wait he's not. Who do we blame for that? This is an excellent review of a wildely overrated movie. Yes, I totally agree it should have been over in an hour and a half, or so. Part of the reason, I believe, that so many of these superhero movies go on forever is that they have to justify their huge budgets - somehow it seems more credible to justify a $180 million dollar budget when the film is 150 minutes, instead of just 90 or 100 minutes -- or at least that's what the Hollywood mindset must be. Elsewhere, other reviewers came to the same conclusions (too long, Batman voice resembles Clint Eastwood, etc.) and received massive bashing from the fanboys. Heartiest congratulations on post 500! A very insightful view of Hollywood then and now - and I especially like the vintage super-hero snap (my parents have a video of me as a kid jumping around in a Spider-man costume that they recently subjected my girlfriend to...). I must admit I did skip a few passages which gave away some plot details - I'm still a dyed-in-the-wool comic book movie fan and The Dark Knight doesn't come out here until the end of the week. Campaspe/Siren --- Thanks for the good words and the recent boost at your fine site. I really liked your recent post on "Frenchman's Creek", by the way. Wonder if Universal's video master of that was lost in the recent fire ... hope not, because it looked beautiful when AMC ran it several years back. 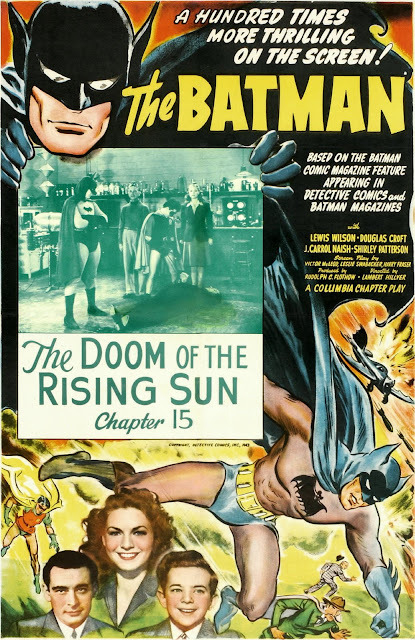 Hi ZAR --- Don't think it hadn't occured to me I might in for "massive bashing from the fanboys", and I'd hasten to add that there ARE a lot of good things in "The Dark Knight", but who among fanboys would bother reading something like Greenbriar Picture Shows? 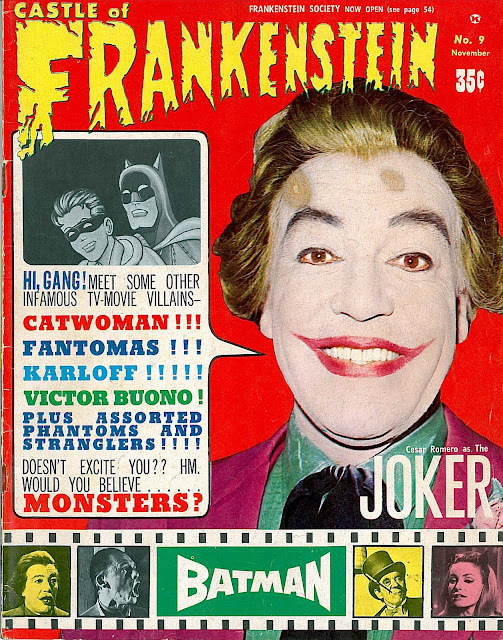 Poptique, I went to your website and really liked all those oddball posters you featured on various counterfeit Batman(s). I didn't realize so many of these things existed! A youthful actor croaks, and all hell breaks loose - remember what they say about the higher value of dead artists' work, as if it is suddenly better post-mortem. 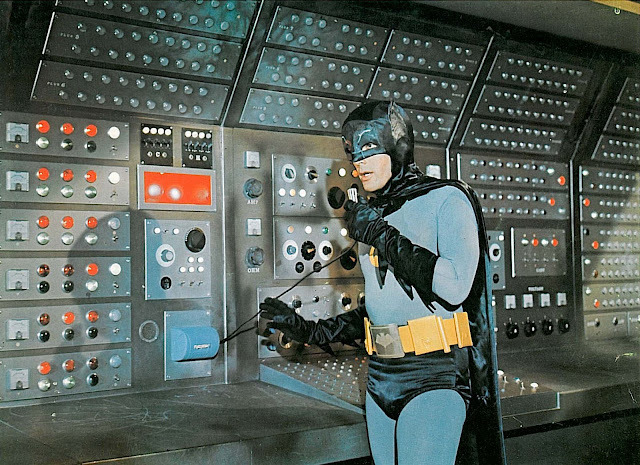 I'll see what all the hulabaloo is about "Dark Knight", but these comic-book blockbusters are getting old; too much FX, too little intelligence. Must work in as much boom as possible, I guess, even if the budget is already bigger than a Zeppelin fulla worn C-notes. Yet critics complained about Will Smith's "Hancock" clocking in at 90 minutes on a $150-million budget. Seems like they should be complaining about the cost rather than the running time. 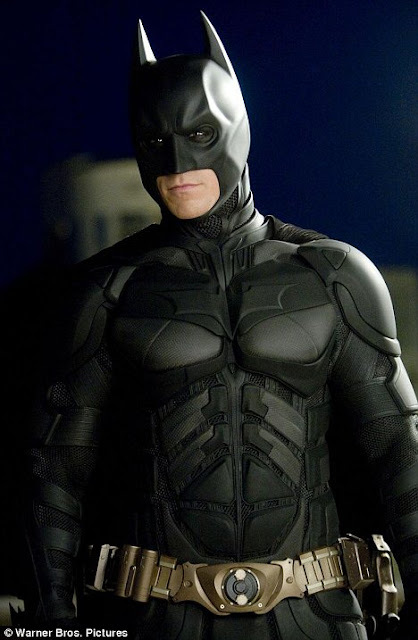 My 12 year-old daughter, by the way, has no interest in seeing "Dark Knight," saying, "I don't like comic book heroes." There's $8.75 I'll save at the box office. I ended up liking the movie more than I thought I would, but it took me an hour and a half to get to that point (I wouldv'e enjoyed it a lot more if they'd jettisoned the whole Hong Kong sidetrip). A big problem, though is that everybody else in the movie is more interesting that Batman--like you, I couldn't stand how he talked. 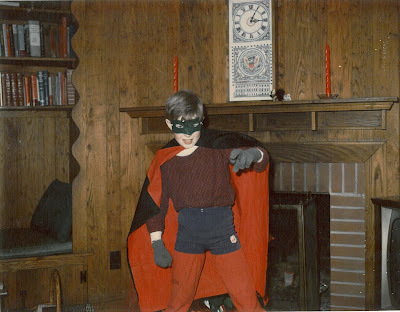 I was huge comic fanatic growing up (not so much a Batman fanatic, I was more of a Marvel fan but I did read Batman comics occasionally). But I agree with most of your review. I would say it’s better than ‘Batman Begins’. I thought the dumbest part of the movie was the “cell phone” surveillance device. Where did that come from? As a comic fan, I don’t like the way they’ve turned Batman into James Bond, with Fox as Q. He’s been described as “the World’s Greatest Detective” in comics, didn’t see that in ‘The Dark Knight’. It would have been nice to see him use his brain a little more than his gadgets. As for Ledger, yes it’s a good performance, but not exactly earth-shattering. In the comics, the Joker (in the past 40 years, at least) is a homicidal, nihilistic psychopath. So his portrayal wasn’t that shocking to me. I’ve found the comic book movies to be generally mediocre. I thought ‘Superman II’ and the ‘X-men’ franchise were the best so far. 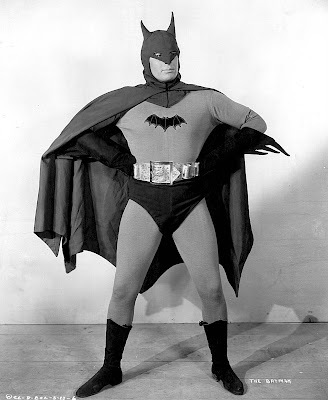 I heard a few laughs in the theater when Bale did the “batvoice”. 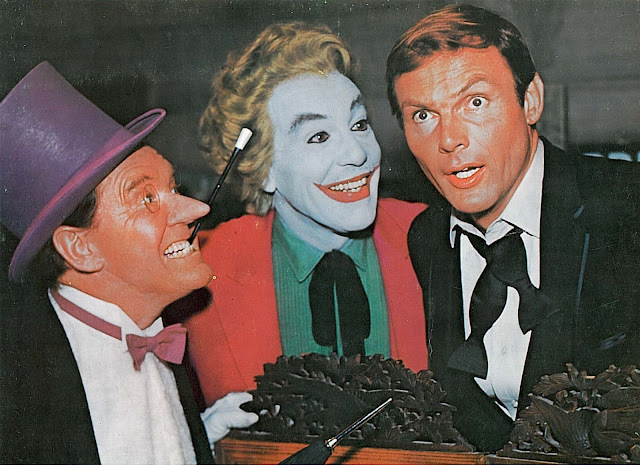 Well, if Bale's Batman sounds like Eastwood, let me ask: does anyone here find Ledger's joker a trifle familiar? Throughout his performance, I was struck by little mannerisms and inflections that made me think of another actor. I hesitate to mention the man's name for fear of spoiling it for anyone who hasn't yet seen the film ... and maybe I'm completely off-base, but it sure seemed like Ledger was aware of what he was doing. Sort of tipping his hat to one who has gone before him. MDG 14450, I'm intrigued by your eight year old saying theatres are too loud. I'd begun to think only people my age and older felt that way. The biggest reason I don't go out to movies anymore is that they're just so ear-splittingly LOUD. It didn't used to be this way. Who made the decision to crank up volumes (seemingly everywhere), and for what insidious reason? Movies are louder because it's supposed to make people think what they're watching is exciting. it's why movie ransoms are always in the billion-dollar range -- it makes up for the lack of genuine drama. Comic book movies, much as I enjoy some of them, put me in mind of something Pauline Kael once wrote: "Red River is not really so 'great' as its devotees claim (what Western is?)..." Whether or not Kael was right about westerns, I think the same concept holds for superhero movies -- the absolute creme de la creme among them are only about half as good as the fanboys (and they're all boys) think they are. As for Earl B's inquiry -- yes, Heath Ledger's Joker definitely reminded me of someone. Don't know who Earl is thinking of, but it struck me even in the trailers, and I mentioned it in my review: Richard Dreyfuss. Hi John: I love your blog, it's one of my favorite sites of the web. 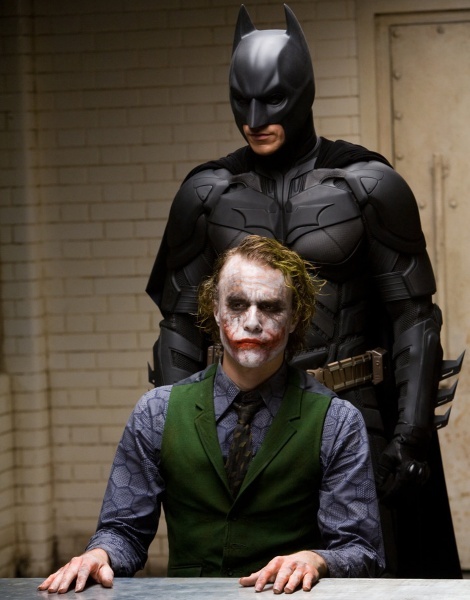 I particularly liked your post about “The Dark Knight.” I posted my thoughts about it on my blog (http://kevinsmoviecorner.blogspot.com/). My blog is a minor effort compared to yours and someone like the Self-Styled Siren. I’m in awe of people like you and her who write so eloquently…and are witty at the same time. I was going to post a comment linking my blog but I didn’t know if that was appropriate or not. I wanted to run it past you first. It’s kind of long, but I tend to get impassioned (but I hope not mean-spirited). Again, I always look forward to your posts. Thanks for writing and the link, Kevin. Well, I guess everybody's seen it by now, so ... I saw a good deal of Jack Lemmon in Heath Ledger's Joker. Just a touch here and there, but certainly throughout. If anyone's planning on seeing DARK KNIGHT again, pay particular attention during the Joker's hospital visit to Harvey Dent. That's got the highest concentration of "Lemmony" bits. Subtle, but definitely there. I thought Ledger sounded like Andy Rooney myself.